Many organisations have implemented a shared services center for common HR processes, but most are not realising the full intended value. An HR shared services solution shifts more service delivery to the employee self-service tier, both improving operational efficiency and increasing employee satisfaction. Multi-tier Support Use a multi-tier approach to service delivery. Provide Tier 0 support for employees to find their own answers, reducing requests for your Tier 1 HR representatives. Requests that cannot be resolved are easily escalated to the next tier. Multi-location Support Standardise HR processes and metrics globally, while also localising content and processes for users. Knowledge Portal Provide employees with a company-branded portal, accessible via multiple devices, and empower them to find relevant information in a personalised knowledge base. HR Case Management Enable employees to send a request to HR, which is automatically routed to the right person in HR based on predefined workflows. HR Processes A powerful way to build and automate on-demand HR processes in minutes. Request Automation Set up workflows to automatically assign incoming requests based on employee attributes and request category. Employee File Management Directly access employee files that are relevant to a request, and automatically archive all requests and associated HR documents in an employee’s digital file. SLA Measurement and Reporting Monitor Key Performance Indicators such as as SLAs (service level agreements) with dashboards and have a clear view on average response time, number of incoming requests, satisfaction rate, and more. Call Center Integration Integrate with a phone system to monitor and track employee requests made by phone. This adaptive and flexible tool gives even non-technical administrators the capability to create and publish people-centric HR processes in order to be responsive to compliance and employee engagement. This is a cost-effective way to harmonise routine HR processes from various locations or business units into standard processes used across the entire organisation. 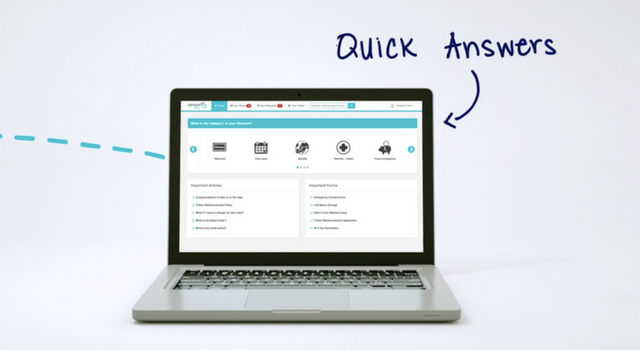 Enable employees to find the answers to their own HR related questions through a self-service knowledge portal, and ensure employees receive consistent and timely responses to questions they cannot answer on their own. Reduce the number of requests HR receives by email or phone, and improve HR responsiveness by automating workflows to assign and escalate requests. Track and report on key metrics in order to measure and continuously improve HR service delivery performance. Learn how a financial institution implemented a Shared Service Center and achieved benefits beyond cost savings. Discover how Natixis used PeopleDoc to maximise the value of their Shared Service Center. Written by Tim Sackett, and originally featured on The Tim Sackett Project, this post highlights the pieces of PeopleDoc he loves most.